About a month before my twenty-first birthday--which was near the end of my senior year in college--my parents started telling me about the fantastic gift they'd found for me. "You've wanted one of these for so long that you don't even remember wanting it," my mother said on the phone about two weeks after they started teasing me about how I'd never guess what they'd gotten. My friends and I talked this mystery gift over at dinner nearly every night. I only wish I could remember the things we guessed it might be. "Should I be scared?" I asked them. They knew my parents. They said, "Maybe." My whole family came to Gambier for Honors Day that year; it fell very near my birthday, and so they brought my presents with them. I drove to their hotel, equal parts nervous and excited to know, at long last, what they'd been hiding all this time. --and then I was left holding the bag. A black garbage bag, wrapped over a large wooden frame. I pulled back the garbage bag, and there was my very own velvet Elvis. Now, I don't remember ever having wanted a velvet Elvis. But it's the kind of thing that, once you have it, you can't quite imagine not having acquired. And the story that came with it was its own brand of priceless. On his way home from work, my father used to turn right at an intersection of two state highways, on one corner of which vendors would sometimes set up stalls in a gravel parking lot. 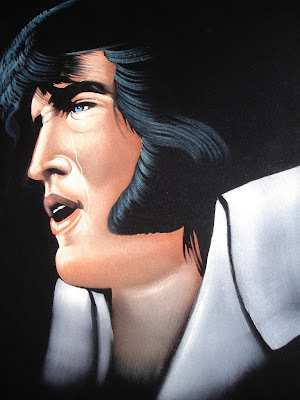 One evening in early 1997, he was getting ready to turn when he noticed that a person was selling velvet paintings--including a couple of Elvises. He rushed the rest of the way home and picked up my mother, telling her that she had to come with him, that it was really important. They dashed back to the intersection, where the vendor was still selling his velvet paintings. My mother stayed in the car. My father went to the vendor and started talking with him about his Elvises, deciding which one he was going to buy for my birthday. But while he decided, he spun another narrative, this one about my mother. "My wife's so emotional she couldn't even get out of the car," he told the seller. "She's just so choked up about the King. She thinks this one is just so beautiful." He gestured to the tear running down the face of the Elvis he had decided he was about to buy. "Good God almighty," the man replied. By this point, my mother was probably covering some part of her face because she was laughing, or feeling embarrassed, or both. My father paid the man and got back into the car with the painting. Elvis has a prominent place in many of my photos from the week leading up to graduation. He had pride of place in the kitchen in Ithaca. In 2002, he acquired a red feather boa. We hung him--boa and all--over the formal dining room fireplace in the house I rented in Rochester. He rode in the backseat with me when I moved to Gambier. And he's been living at the top of my stairs for three years. Today, I reached the moment in settling in to the apartment where I had to decide where he's going to go now. Because I'm trying out a somewhat new aesthetic--one based around frames and invisble hangers rather than thumbtacks, for instance--I've decided to downplay him a bit. And so it is that I've given him a spot on the back of my bedroom door, a resting place from which he can come out for fuller view but where, in the meantime, he'll be safe. Sometime in the last three years, the feather boa rotted in some crucial way, so that as we emptied my house onto my front lawn a couple of weeks ago, red feathers fell everywhere. By the time we got the boa near the apartment, I'd made up my mind that it shouldn't come through the front door, not into a relatively clean space. (One of my Clevelander students promptly claimed it, rather than see it go in the garbage.) But this morning I noticed just how much damage the boa had done to Elvis: little red featherwisps stuck everywhere on the frame and on the velvet. And Elvis was far dustier than I'd remembered--which is not so surprising, given the length of time I've had him and the relatively small amount of cleaning him that I've done. And that's when the Dirt Devil got involved. I hadn't yet used the PowerBrush attachment when I launched the Hang Elvis project this morning, but I decided to give it a whirl. And, lo and behold, it whisked all the dust of the ages--and all the red boa feathers--right off that soulful man and his incredible sideburns and his mammoth collar. And so it is that the Dirt Devil saved my velvet Elvis. Now he's hanging once more, and clean to boot. (For the rest of the day, I worked at the officehouse with my furry beastie, who's been taking the heat pretty hard these past few days. Last year when my excellent friends were out of town, he and I tried going to the officehouse, but he was too agitated, and so we went home again. This year, for some reason, he was able to calm himself down more swiftly; within about fifteen minutes, he was as sound asleep as he's been in days.